First Off - What is OAuth & Why do You Need it? OAuth (the Open Standard for Authorization) is an open protocol which provides token-based authentication and authorization - as opposed to the standard username and password requirements. It allows third party services to use the end-user information without revealing their personal credentials. The user is known on website A by the credentials (i.e. first name and last name) that he set up on website B. This entire process is known as the flow. 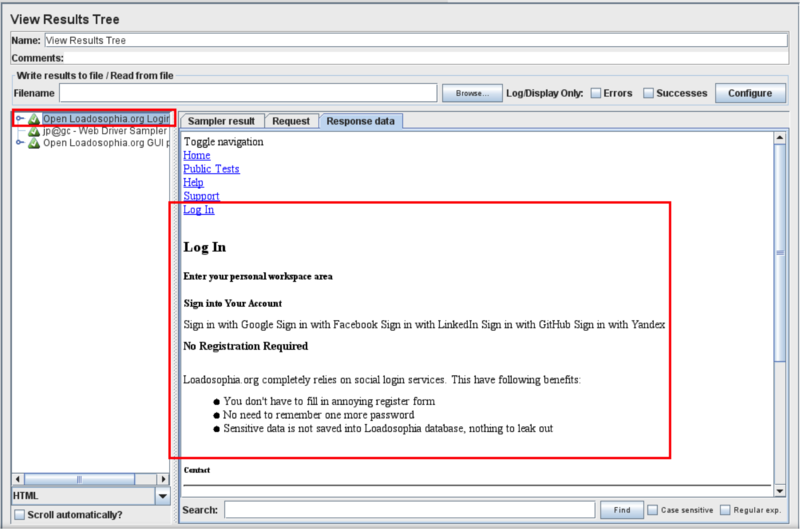 As you can see, the end user doesn’t need to enter his credentials at all on website A, which makes it far more secure. OAuth version 1.0 was first released in 2007. Twitter was the first platform to start using OAuth to access its API. By 2010, the platform had made the use of OAuth compulsory for all 3rd-party applications working with its API. In the same year, IETF launched OAuth 2.0. Like its predecessors (Oauth 1.0 and OAuth 1.0.a), OAuth 2.0 gives users the ability to grant third-party access to web resources without sharing their passwords. New features in OAuth 2.0 include new flows, simplified signatures and short-lived tokens with long-lived authorizations. OAuth has a huge number of flows, different protocol versions - with opposing viewpoints on them (the creator of OAuth 1.0 withdrew his name and support from OAuth 2.0 due to suspected security flaws) - and various server/client sides implementations (OAuth 2.0 leaves a lot of things up to the implementor). It’s impossible to cover all of this in one article! In today’s post, my main aim is to show you how to run performance testing with JMeter on OAuth-secured applications - so I’m going to focus on the key areas of OAuth only. Of course, you’re always welcome to post questions at the bottom if you’d like to find out more about another aspect of OAuth. OAuth 2 Simplified - A great “informal” article. Highly recommended! This first option is the closest one to a real-life user experience (logging into website A with your credentials from website B). 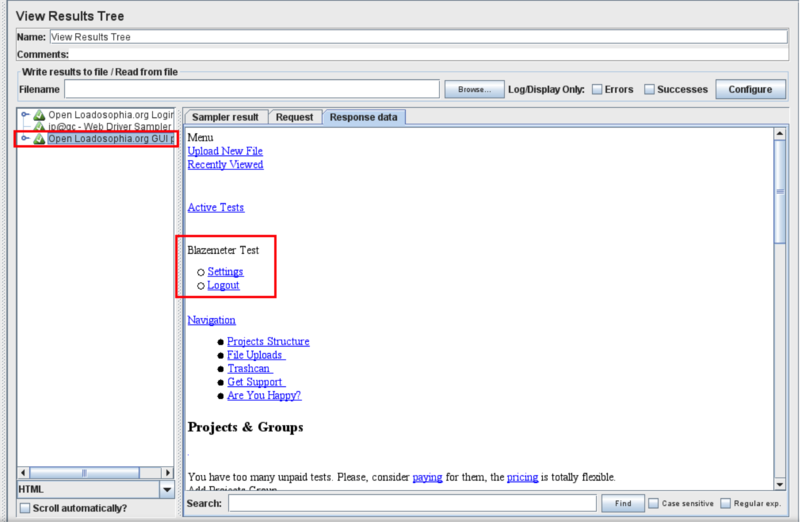 For this test scenario, I’m going to use BlazeMeter Sense - a free site which allows you to upload and analyse your JMeter load test results through a simple plugin. BlazeMeter Sense doesn’t give you the option to login with a username and password - it works only through OAuth. You can verify that the login was successful by checking the View Results Tree Listener output. 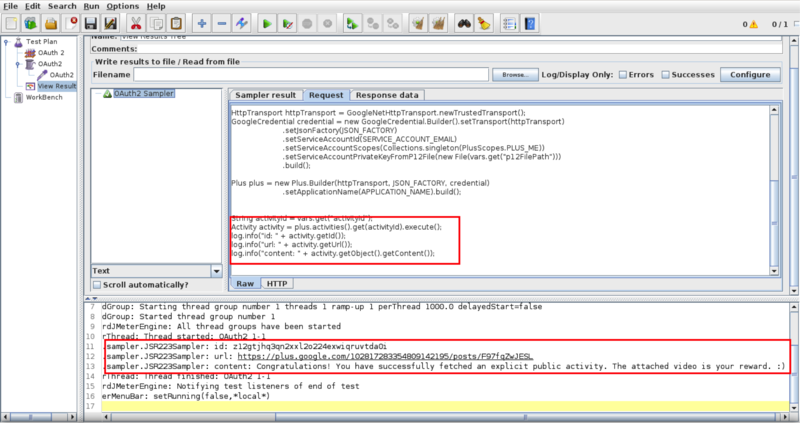 When you’re testing for multiple users, I recommend logging them in one by one and storing the cookies in the setUp Thread Group in JMeter Properties. You can then reuse these cookies in the thread groups where the real load is created. Set the “webdriver.firefox.bin” property to point to the Firefox binary (if it’s not in your system PATH) in the system.properties file. Change the “username” and “password” in the User Defined Variables to the details from your Google account. You should be able to get the same results. Exchanging the Authorization Token to the Access Token - which can be used to access protected resources. The most tricky part is the oauth_signature. Here’s how you do it for each method. RSA-SHA1: PKCS#1 of Signature Base String hashed by Consumer’s private RSA key - and again Base64 and URL-encoded. See OAuth 1.0 for detailed explanations, sample requests, etc. As recommended in JMeter Performance and Tuning Tips and evidenced by Beanshell vs JSR223 vs Java JMeter Scripting: The Performance-Off You've Been Waiting For!, the right Test Element to be used when developing the OAuth 1.0 client side code is the JSR223 Sampler with Groovy. Do the same for the latest version of the oauth-signpost jar for the /lib folder of your JMeter installation. As for signpost-core-1.2 and JMeter 2.11, the signpost-core.jar should be enough as other dependencies are already part of JMeter. Looking for sources and libraries? Check out the https://bitbucket.org/blazemeter/oauth1/ repository. It contains everything you need. You don’t need to change anything, just unpack, restart JMeter and launch. OAuth 2.0 is considered simpler and easier than OAuth 1.0/1.0a. It doesn’t require any crazy signatures, timestamps or secrets - and for the simulation, all you have to do is add a HTTP Header Manager as a child of a single request, or at the same level as all requests (depending on the desired scope). is enough to access protected resources. Now, let’s take a look at the User Defined Variables that need to be set and see where to get the appropriate values. Choose “Service Account” (elsewise you’ll need to provide a redirect URL and use the browser for Google Authentication). See the first section for more information on this. I think that pretty much covers the key ways you can access OAuth-protected resources. If you’re already using BlazeMeter (or considering using it), it’s probably worth mentioning that it supports all of the approaches mentioned above.